A Service of the Taos Public Library…April 2015……written by Joanne Forman……. It’s finally Spring, and as well as the voice ot the turtle dove, the voices of gardeners are heard in the land. Trowels, seed catalogs in hand, and that fanatical gleam in their eyes, hundreds and hundreds of Taosenos are descending upon their yards, determined that THIS YEAR, everything they plant will grow, everything will be bounteous and beautiful and satisfying. And, of course, your Taos Public Library is ready to offer all the hope, help, advice you could possibly need, with over 250 books on all aspects of gardening. Go to! You DO have a library card, don’t you? If not, get one instantly! Most of the books on gardening in our library are in the 631-638 area, according to our Dewey Decimal System, so we won’t give all the exact numbers—except for the exceptions. WATERWISE PLANTS FOR SUSTAINABLE GARDENS. Laura Springer Ogden. GARDENING THE ARID LAND. Robert Gerard. 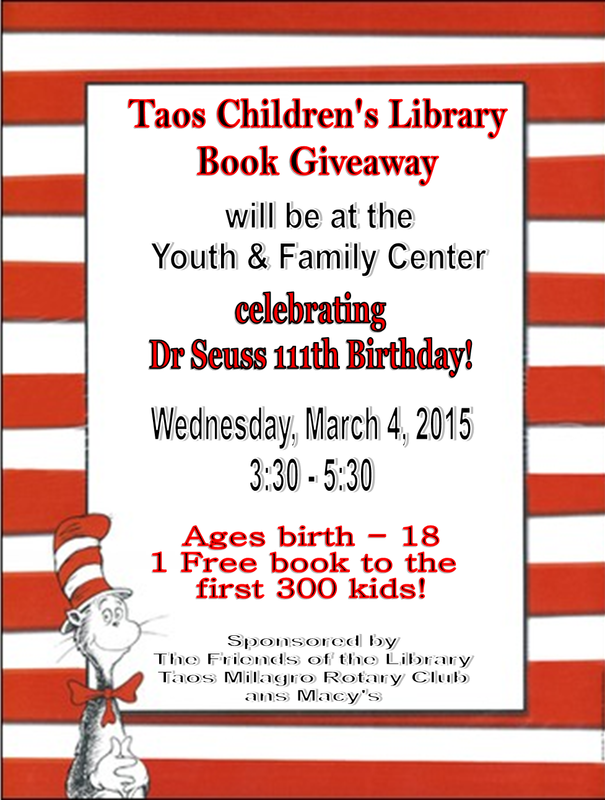 A service of the Taos Public Library. March 2015. written by Joanne Forman……. Yea, verily! And yet we all know that it’s the most important job in the world. Fortunately your Taos Public Library is ready to help, with books on all aspects of this formidable, sometimes agonizing, ultimately (one hopes) rewarding task. THE guide is, possibly, still: Dr. Spock’s Baby and Child Care by the late Dr. Benjamin Spock. ( 649.1 Spo.) Reassuring and practical, it is very detailed, and full of detail about everything single mothers you’re likely to run into when caring for a new, small human. Perhaps just as useful, and still relevant long after his departure from the scene is The Mister Rogers Parenting Book, by the late Fred Rogers. His gentle, low-key insight into the fears, sorrows and joys of a child is a marvelous guide to understanding your own cherub. ing balls as parents express their anger; this book can help avoid that sorry situation. Family by Stephen and Jeffrey Marks. (420.42Mar.) In most nations of the world, the teaching of a foreign language begins in the first grade or even kindergarten. The mantra in the USA, however, is that it will confuse children. To which this writer has always asked, are our kids stupider than others? Of course not! And those who grow up in bi-lingual (or more!) households don’t seem especially confused. In today’s global world, more than one language needs to become the norm! Another aspect of today’s life is that expensive treats and ventures are increasingly beyond the reach of parents. (Why this is so is a whole other topic!) But there’s help available: The Big Book of Family Fun by Gwen Ellis (649.1 Ell) shows ways you can enjoy life without a lot of money. It is often with fear, trembling, frustration and sheer angst that parents face dealing with the troubled, troubling teens. Fear not! My Space by Candice M. Kelsey (305.235Kel.) Good luck! A Drug Free Kid by Joseph Califano. No matter your offspring’s age, a parent can always use Is That Me Yelling? By Rona Renner (649.1Ren.) The parent who’s never yelled at their kid is either fibbing or is a saint. This book can help you keep your cool—no matter how aggravating your little darling. Parenting. This magazine has a wide range of up-to-date information about every aspect of this—the most important job a person can do. Like all public institutions, the library always needs monetary help! If you can afford to sponsor this or any periodical (or if you can get together people to do so)—that is an enormous benefit for the entire community.